One of my Mom-in-law's recipe. She is my great cooking inspiration who changes only the method with the same ingredients and drive different and unique taste for each recipe. I am yet to learn more and more from her. flower and cabbage. Use this a base and do your own variations with other vegetables. 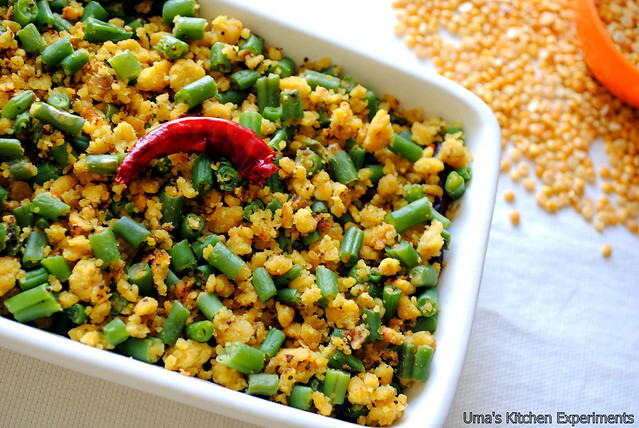 As the name depicts, it is a crumple of lentils cooked with vegetables and served as a side dish for steamed rice in India. 1) Cook the chopped beans with salt using microwave or in a pot by sprinkling handful of water. Beans should be well cooked for this recipe. Keep it aside. 2) Soak the toor dal in water minimun for 2 hours. After 2 hours drain the water from toor Dal and grind it coarsely with cumin seeds, 3 red chillies, turmeric powder, a pinch of salt and asafoetida. Don't add water. The moisture in the dal is enough. 3) Take a kadai and heat oil in it. 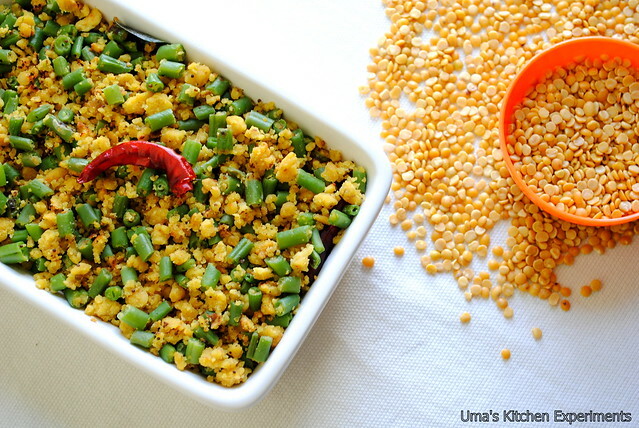 4) Add mustard seeds and urid dal when it is hot. Make them to splutter. 5) Add curry leaves, remaining red chillies and after a second add ground dal mix. 6) Turn the flame to medium and stir the ground dal and cook for 7-10 minutes covered. Make sure it is not burting. (You can use this in between time to cook beans if you would like to do simultaneous work and save time). 7) Then, stir continuouly till they become crumble.Cook uncovered for 3 minutes by stirring continuously. 8) Add cooked beans and mix well. Cook again for few minutes. 9) Beans paruppu usili is ready to serve. I used birdseye red chilli for grinding to get spiciness and added the usual one for seasoning to get flavour. It is your choice to choose any of these or your own. Ur beans paruppu usili is very tempting. I prepare once in a while as it takes time especially stirring the ground dhaal to crumbs. My mom suggested an alternative but im yet to try that. After grinding dhaal,make it as balls, steam it in idli maker and then crumble the steamed balls. Then saute the crumbles with chillies and mustard seeds. very tempting clicks Uma. One of my favorites. Priya is right. I too make it the same way. first time here and loved your blog! Very nice, delicious and innovative recipe. Looks yummy and perfect with roti. Wonderful presentation. My fav with rasam rice very yummy. I love paruppu usili. Looks so yummy and inviting. Hearty Thanks for your suggestions. My MIL also prepares using Idly maker as well as using microwave. I used this method, as I was not having the idlimaker by the time I prepared this recipe. Thanks for your comments. You words are my inspirations. this is very interesting..i too prefer steaming the dal n adding it to the stir fry but this sounds easy n less job rt?? so colorful n pictures are too good n neatly presented!!! love the combo, delicious n healthy, great clicks !! never tried this way !! so interesting and looks delicious !! Wow I love this dish! Looks so delicious. Beautiful photographs make it even more enticing! uma can u let me know the egg replacer for making spinach muffins. !We are vegetarians and dont eat eggs. All ur recipes have great artistic creations of display.Keep up the good work.